All you need is a tiny massage ball. Finding the perfect shoe isn't easy. The prettier they are the more uncomfortable they are too, especially if you've got flat feet. In the video below, Raj Suppiah, owner and physiotherapist at Foundation Physiotherapy, demonstrates three easy exercises and stretches to help lift fallen foot arches. "Typically, feet flattening occurs as a result of the lower leg compensating for ankle joint stiffness," Suppiah tells HuffPost Canada. "The foot flattens, making more way for the shin to flex over the stiff ankle." But while flat feet might help stiff ankles, it can cause a lot of stress on the plantar fascia (the band of tissue connecting your heel to your toes), leading to other aches and pains like heel spurs, shin splints and back pain. 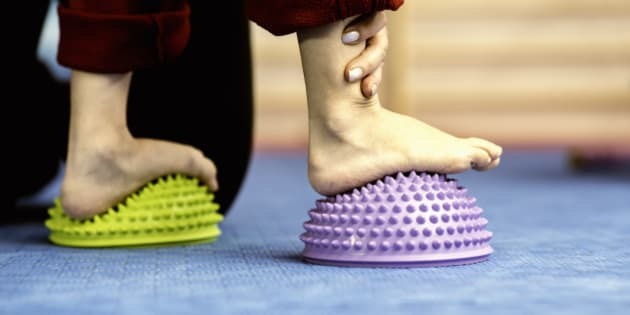 "Forcing ankle mobility with an arched foot by using a lacrosse or massage ball to prevent falling arches promotes optimal ankle mobility without deviating the position of the foot," Suppiah adds. Flat feet can be caused by many things including arthritis, injury, weight gain and disease. Weak hip abductors and external rotators can also lead to flat feet as hips rotate in and flatten feet by pushing the toes away from the midline. While these stretches provide temporary, albeit instant relief for flat foot-related pain, treatment for fallen arches varies depending on cause and severity of the problem. One thing's for sure though, custom orthotics and supportive footwear are a must. Watch the video above for more tips on treating flat feet. In this fitness series, we look to fitness and well-being experts for three exercises to relieve common pains and ailments. What condition would you like to see us tackle next? Shoot us an email at CanadaLiving@huffingtonpost.com or let us know in the comments below.